Hi friends, in this article, I am going to describe the earth tester working principle and method of earth resistance measurement by it. I hope you will find it informative and helpful. The Resistance of the earth can be measured with the help of megger earth tester or earth megger. The earth megger is essentially a direct reading ohmmeter and it has a hand driven generator which supplies the testing current. The ohmmeter essentially consists of two coils (current coil and pressure coil) mounted at a fixed angle to each other on a common axis. It has four terminals P1, C1, P2 and C2. Its terminals P1 and C1 are short-circuited. This junction makes a common point. Hence it has got three terminals E (common point), P (P1) and C (C1) outside. To measure the earth resistance with a megger earth tester, the earth electrode under test is connected to its E terminal and P and C terminals are connected to auxiliary electrodes through a connecting lead of negligible resistance. When the handle of the megger earth tester is rotated at a uniform speed, it directly indicates the earth resistance on the dial or calibrated scale. Set of readings are obtained by burying the electrode P at various positions. Firstly, it can be buried between earth electrode and current electrode C. Secondly, it should be hurried 15 meters away from the earth electrode on the opposite side of current electrode C. Then it should be buried 15 meters away from the current electrode C. The mean of the three readings gives the resistance between the earth electrode and soil. The resistance between earth electrode (i.e. plate or pipe etc.) and the soil does not remain constant due to variable moisture conditions. To have good and effective earthing, the earthing system should be tested from time to time and moisture contents in the nearby soil should be increased by adding water. In the case of a fault, when the metal frame comes in contact with the live wire or phase wire, a current will flow through the earth connection, which causes a potential difference between the metal frame and earth. This potential difference should be very low because it will act across a person who touches the metal frame in such a faulty condition. A low resistance to earth will cause high current to flow when the fault occurs. The high current will cause the fuse to melt in a very short time, thus disconnecting to faulty apparatus from the lines thus ensuring safety. All the parts of electrical equipment, like the casing of machines, the casing of circuit breakers, tanks of transformers must be connected to an earth electrode. It is done to protect the various parts of the installation as well as the persons working against damage in case the insulation of a system fails at any point. By connecting these parts to an earthed electrode a continuous low resistance path is available for leakage currents to flow to earth. This current operates the protective devices and thus the faulty circuit is isolated if a fault occurs. The earth electrode ensures that in the event of overvoltage on the system due to lightning discharges or other system faults, those parts of equipment which are normally dead, do not attain dangerously high potentials. In a three-phase circuit the neutral of the system is earthed in order to stabilize the potential of the circuit with respect to earth. An earth electrode will only be effective so long it has a low resistance to the earth and carry large currents without deteriorating. Since the amount of current which an earth electrode will carry is difficult to measure, the resistance value of earth resistance is taken as sufficiently reliable indication of its effectiveness. The resistance of the earth electrode should be to give good protection and it must be measured. Shape and material of earth electrode of electrodes used. Depth in the soil at which the electrodes are buried. The specific resistance of soil and in the neighborhood of electrodes. The specific resistance of the soil is not constant but varies from one type of soil to another. The amount of moisture present in the soil effects its specific resistance of earth electrode is not a constant factor but suffers seasonal variations. This calls for periodic testing that the earthing system remains reasonably effective. Thanks for reading about earth tester working principle and construction. You may ask questions, if any, in the comment section. #6 Which of the following instruments may be used to measure D.C. voltage accurately ? #9 The accuracy of a meter is determined by…………. deflection. starting torque on the meter pointer. the change in same reading when input is first increased and then decreased. #15 ………. meter has the best accuracy. #16 . …………. damping method is common in moving coil instruments. any of the above . #19 Which of the following will happen if a voltmeter is connected like an ammeter in series to the load ? the true power and the reactive power. 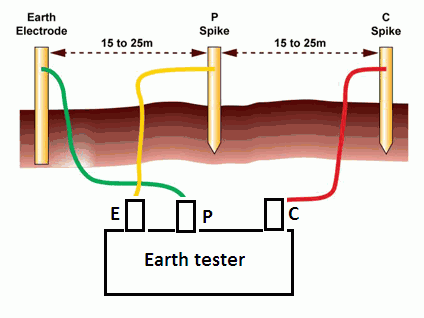 © http://www.yourelectricalguide.com/ earth tester working principle and construction.